The Naked Face surveys the development of self-portraiture and its major concepts over the last four hundred years. The exhibition is drawn entirely from the NGV’s collection, and it is perhaps one the very few exhibitions to bring together works by Australian and International artists within the same space. The passion of the exhibition’s curator, Dr Vivien Gaston, for the subject of portraiture is evident, as she left no stone unturned in her search for self-portraits across the gallery’s various departments. As the result, it includes paintings, works on paper, prints, photographs, fashions, textiles, video and installation works by such artists as Rembrandt, Anthony van Dyck, Fred McCubbin, Rupert Bunny, Chuck Close, Cindy Sherman, Francesco Clemente, Arthur Boyd, John Perceval, John Brack, Albert Tucker, William Dargie, Peter Booth, Rick Amor, Juan Davila, Tim Storrier, Destiny Deacon, Antony Gormley, John Nixon, Lewis Miller, Patricia Piccinini, Vernon Ah Kee, and numerous others. The number of works on view easily exceeds a hundred; the exhibition spans across four major gallery spaces on the NGV’s upper floors at the Federation Square. The exhibition contains a number of the most popular and beloved works within the NGV’s collection, such as self-portraits by Joseph Highmore, Joseph Wright of Derby, George Lambert, Hugh Ramsey, Andy Warhol; Johann Zoffany’s homo-eroticised self-portrait of himself as David with the head of Goliath; Jacopo Amigoni’s striking portrait group which includes the famous opera castrati Farinelli; and Peter Booth’s Painting of 1977, portraying the artist against a post-apocalyptic background. The Naked Face provides an opportunity to see and consider these works within a new context. 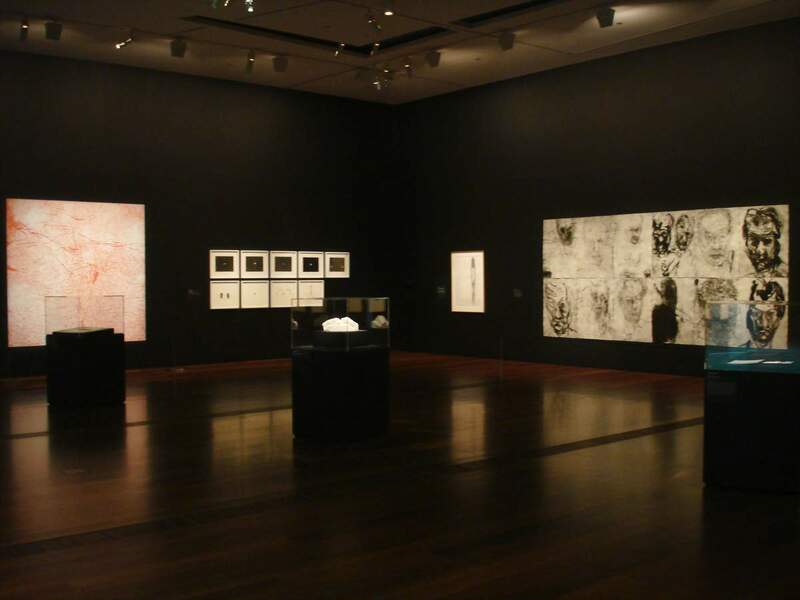 It also includes a number of remarkable works, which are seldom on display, such as Napier Waller’s excellent self-portrait in front of his State Library mural; Farrell and Parkin’s La Piedad, a double-self-portrait in the guise of Virgin Mary mourning the Christ; a powerful set of Mike Parr’s self-portrait etchings; or Julie Rrap’s digital video work showing the artist melting in her own reflection. It is surprising that sculpture is all but absent from the exhibition space, but this is perhaps the limitation of the collection rather than a curatorial oversight. Gaston approached the exhibition as an academic, intellectual, and educational exercise. It is accompanied by a catalogue with an excellently researched essay, showing the depth of her knowledge on the subject. The body of the catalogue is divided into several thematic chapters, each of which pursues and explains in depth various aspects and nuances of self-portraiture, and provides a very informative and erudite read. The text flows clearly and coherently; juxtapositions of works within the pages of the catalogue appear innovative and challenging. However, when the attempt is made to translate the contents of the book into an exhibition display, chapter by chapter and page by page, the whole concept becomes somewhat unstuck. 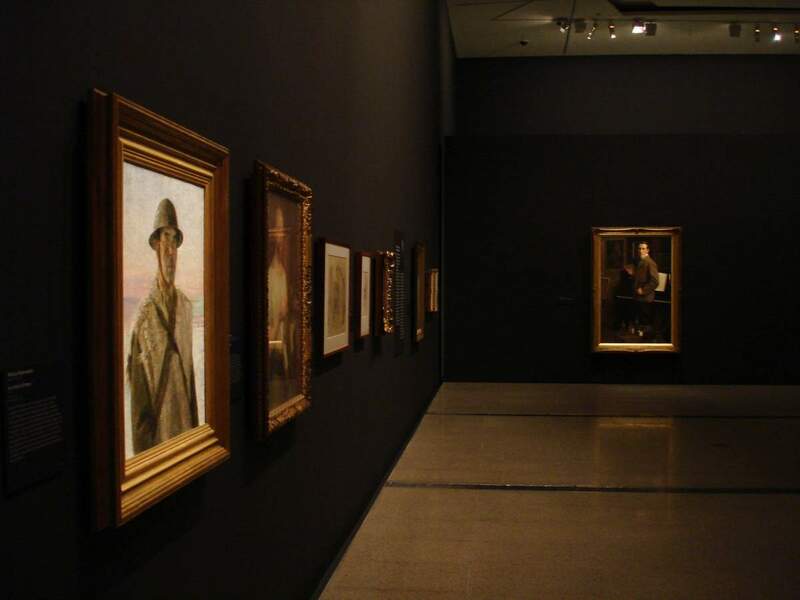 Unlike, for example, the famous gallery of self-portraits at the Uffizi in Florence, or various specialist portrait galleries around the world, the National Gallery of Victoria is not a collection of that is focused on this particular genre. The limitations of the NGV’s holdings of self-portraits simply do not keep up with the academic premise of Gaston’s curatorial thesis, and it appears that she has done the best she could with the available exhibition material on hand.